Yesterday, Wesley Clark Jr -- son of retired U.S. Army General Wesley Clark -- met with North Dakota law enforcement officials on behalf of the 2,100 members of the Veterans Stand for Standing Rock group, who have pledged to come to the conflict site and build barracks to shelter the water defenders fighting the Dakota Access Pipeline. The veterans are mustering in nearby Eagle Butte over the weekend, then travelling in busloads to the protest site. 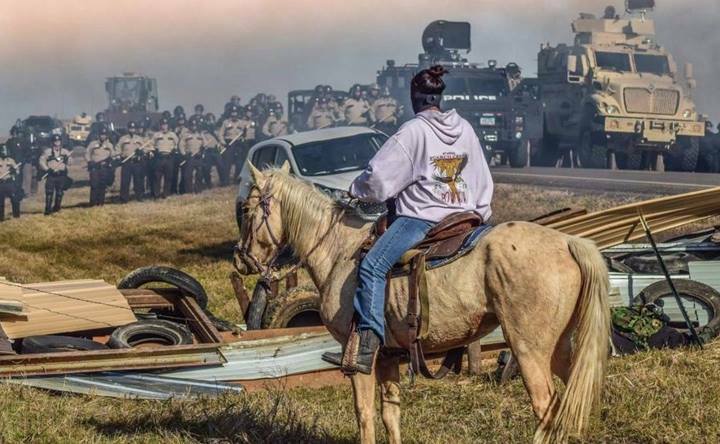 The solidarity move comes as the Republican governor of North Dakota has ordered the protesters to clear the area, citing the danger of exposure to the elements, and as the US Army has publicly stated that it will not participate in the forceful removal of the protests. The veterans have also volunteered to be human shields between the indigenous people leading the protests and the settler law-enforcement officers who have used violent tactics against them and the press who have covered the confrontation. Some of the more than 2,100 veterans who signed up on the Veterans Stand for Standing Rock group's Facebook page are at the camp, with hundreds more expected during the weekend. Tribal leaders asked the veterans, who aim to form a wall in front of police to protect the protesters, to avoid confrontation with authorities and not get arrested. The Pentagon is seeking bids to improve its Advanced Targeting and Lethality Automated System (ATLAS) so that it can "acquire, identify, and engage targets at least 3X faster than the current manual process."